So I’ve already written about the Brown Butter Rice Krispie Treats I made for the Memorial Day weekend so that there would be a lighter dessert option, but then I made this blueberry upside down cake for the more indulgent end of the spectrum! As I’ve gotten older I tend to prefer fruity desserts to chocolate ones (I know – I’m shocked too) so I really liked this cake. It’s dense and moist and the blueberries provide the perfect summer-y topping. It was patriotic for the holiday weekend too. (I suspect you could just add some sliced strawberries for the perfect July 4th dessert. Good idea for next year.) So if you’re looking for a great fruity dessert definitely give this blueberry upside down cake a try. It’s really easy to make. I have pinned lots of different varieties of upside down cake on Pinterest (pineapple, cranberry, pear, plum), but this one needed the least amount of preparation. You can just throw the blueberries in there whole – no peeling or slicing required!. And it looks fancy so everyone will think you slaved away in the kitchen. Bonus! Combine the 1/4 c melted butter and brown sugar. Spread the mixture evenly on the bottom of a 9″ round cake pan. Spread the blueberries evenly over the brown sugar mixture and drizzle the lemon juice over the berries (I might have forgotte this step). In a large bowl, cream together the butter and granulated sugar. You can use an electric mixer, but I just used mixed everything by hand. Add the egg, extracts, and mix until combined. Add the baking powder, salt, cinnamon, and flour and mix until just combined. Add the buttermilk and stir until combined. Spoon the batter over the blueberries and carefully spread it evenly. Bake at 350 deg F for about 45 minutes or until a toothpick inserted in the center comes out clean. Let the cake cool 10 minutes in the pan on a wire rack, then invert on to a large flat plate. Serve warm or at room temperature. Enjoy! 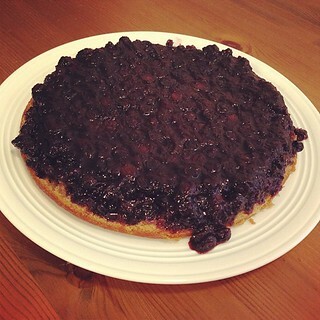 Based on Half Baked’s Blueberry Upside Down Cake.